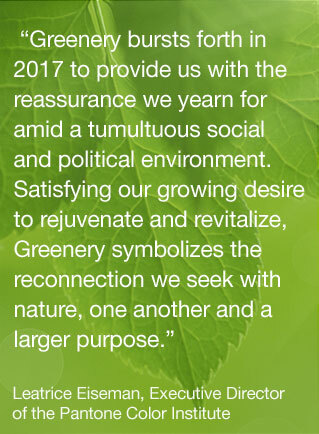 So Pantones chosen “ Greenery” as the colour of the Year! We now await for the hue to arrive in our high street shops.. whether its tops, coats or duvet covers. I had been kind of hoping that Inky Blue was going to make it this year, but it is this bright rejuvenating Green – Not so surprising after the Forestry Trend of last year. This Bright and Vivid fresh colour does reminds me of Kermit the Frog, and a throwback to the 80s – ( an image comes to mind of green bamboo wallpaper and wicker headboards) but it is oozing energy and positivity, and probably the reason I used it for my logo and on my website www.lesleyanninteriors.com. I definitely won’t be painting any walls in this colour but I can see myself using it with Florals to bring the outside in, and injecting pops of this fresh colour within blue and aubergine room schemes. – Bring it on! !